Wolves have signed midfielder Ruben Neves from Portuguese club FC Porto for a Championship record fee. The 20-year-old had been linked with a £15.8m move to Wolves, whose owners, Fosun, have a close relationship with Portuguese agent Jorge Mendes. Neves, who has signed a five-year deal, played under Wolves boss Nuno Espirito Santo at Porto. The Championship club have also signed central defender Willy Boly on a season-long loan from Porto. Although the fee is officially undisclosed, Wolves have confirmed that it is a club record, which would make Neves the most expensive player in Championship history. The previous record was the £15m Aston Villa will eventually pay for Bristol City striker Jonathan Kodjia last August, after an initial payment of £11m. Neves became the youngest captain in Champions League history when he led Porto against Maccabi Tel Aviv in 2015. "I have always wanted to play in England and we have a good team," he told the Wolves website. "We can do good things this season." Wolves boss Nuno told BBC Midlands Today: "Ruben is a very good player who can bring new things to our squad. I know him well. I worked with him last year. "When a player who is 18 years old is captain of a big team like Porto, in the Champions League, it says a lot." 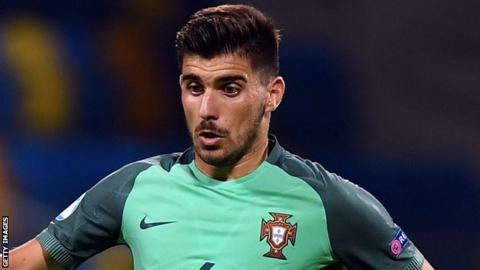 Neves, who played for Portugal Under-21s at last month's European Championships, came through Porto's academy and has made 67 senior appearances, scoring nine goals. It is the third time since Fosun took over as owners last summer that they have broken the club's transfer record, having also done so when they signed Ivan Cavaleiro and Helder Costa. The owners of Wolves, the Chinese business conglomerate Fosun, have made no attempt to conceal their willingness to spend eye-catching sums since taking over last summer. But the big spending has brought considerable attention. Concerns have been expressed about the links between Fosun and the so-called "super agent" Jorge Mendes. Is this unhealthy? The club have suggested that the current arrangements allow Wolves to compete for the sort of player they couldn't have dreamed of attracting a year ago, and frankly many supporters will not care who is arranging what and for how much - as long as the team win more often. It is also the case that not all of the deals done by Wolves since Fosun's arrival have been associated with Mendes, although those involving the largest reported fees do appear closely related to him. Whether spending of this scale will give Wolves any troubles in terms of Financial Fair Play will have to be considered in future, probably in the context of whether they achieve promotion and what dealing is done in the meantime.